You won’t find a definition for hortotropism in a dictionary, but that doesn’t mean it doesn’t exist. In fact, if you are a gardener and more than once you’ve struck up a conversation with a gardener you didn’t know, you know that hortotropism does exist. It’s that natural inclination for gardeners to just start talking to one another about gardening. 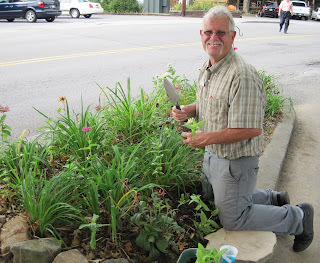 I started talking to the gardener in the Old Mill Square in Pigeon Forge when I saw him out transplanting zinnias a few days ago. Zinnia transplants in the fall? Yes, the gardener said he had read something in the Knoxville paper that if you sow zinnias in late August, they will bloom before the first frost. He said they probably wouldn’t get frost until early November. He wasn’t too sure he’d get bloom but he had the seeds so decided to try. We also talked about the weather, as gardeners do. He wanted to know if we had leaves turning here in Indianapolis, and I said not really except for some of the trees that seem to be under stress anyway, particularly flowering pear trees (Pyrus calleryana) and Red Maples (Acer rubrum). In fact, though the leaves in the Great Smoky Mountains National Park were for the most part still all green, I saw just one or two trees that were fully turned, and I thought they were Red Maples. He said their summer was cool and wet, like ours, so he expected the foliage color to be spectacular this fall. I moved on after complimenting him on the plantings around the area he was responsible for but then a few minutes later when I walked back by, he asked me if tulips do well in Indianapolis. We then discussed how in both locales most of the hybrid tulips are usually grown as annuals, since they don’t come back reliably the second year. I said I was switching to a lot of species tulips because of this. He didn’t care much for those because they were smaller, but mentioned he had an acre planted in daffodils, and we both agreed that those always seem to come back each spring. 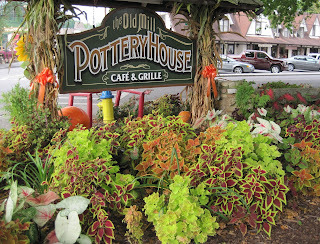 If he grows daffodils as well as he grows coleus and caladiums, two plants he featured in many of the gardens around the Old Mill, it must be a spectacular spring display. And that’s an example of hortotropism -- two gardeners who don’t know each other striking up a conversation about gardening, speaking a universal language of plants and weather, and all things gardening. It is real, isn’t it! Do you have an example of hortotropism to help build a case for this previously unnamed horticultural phenomenon? I don't have an example, because it's such a common thing I don't even notice it anymore. It is real, and it's a wonderful way to connect with people. Thanks for the introduction to Hortotropism. It's one of my favorite things to, of course. Once I struck up a conversation with a gardener setting up for a display garden at Canada Blooms, Toronto's big spring flower show. It turned out to be Mr. Clematis himself, Raymond Evison. We didn't talk about clematis! Pigeon Forge? Pigeon Forge? Good lord have mercy. I hope someone in your family made you go there. Thank goodness you found a nice gardener to talk to to make a visit there worth while. Now I am so looking forward to the pictures of Dollywood and the American Chestnut tree project there. You did go to Dollywood didn't you? I sure hope you went to Dollywood. Christopher... Dollywood? Good heavens, no! I surely didn't go there, so there will be no posts about that or their tree project, though any project to plant more trees has to have some merit! Did the two of you pepper you conversations with botanical latin? It is kind of like a secret handshake to see just green someone's thumb is. I can't think of a particular instance because it does happen all the time. Some people start converesations with 'How about those Mets? but openers about plants work almost as well, even with people who aren't passionate gardeners. Since people locally know me from my garden column, Between the Rows, they stop me to answer questions. And sometimes I can. I thought the same thing Christopher! You'd have to pay me a lot of money to go Pigeon Forge. Carol, I love meeting and talking with gardeners; and have made good friends with neighbors that way. But sometimes interactions in big box stores backfire! I was in line behind a young couple with two flats of Vinca minor...I offered to as much vinca as they wanted~~ free~ they looked at me like I was nuts and bought their vinca. I bet they are digging it out of everywhere now! I find that sometimes when I try to engage someone about gardening, they tend to be a little guarded at first, in a sort of, "should I start geeking out on gardening, or this person just trying to pay me a quick compliment on my roses". But yeah, it's sooo wonderful when the conversation gets going and you're practically fighting to airtime to discuss. There are two endeavors that reach across all lines of age, religion, race, gender, etc. : music and gardening. The love of either (or both) of these transcends other societal distinctions. Your observation is so true. 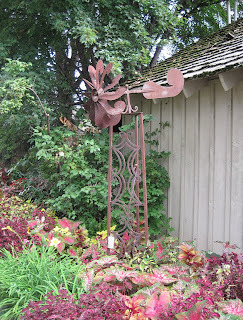 Gardeners seem to have an antenna that recognizes other gardeners. We love plants, and planting, and propagation, and some of us even like to weed and deadhead. For me, gardening (and music) are the most relaxing of endeavors, as well as the most reverent. I'm usually the other half of the gardening conversation, the public gardener. When I talk to visitors, I can quickly spot one of us and will comment, "You must be a gardener." The gardeners always smile, we have an interesting conversation and they leave with a plant start or some seeds. I thought I had a pretty good vocabulary, Carol, but you're always adding new words to mine! Yes, I definitely have experienced hortotropism--conversing with complete strangers in the checkout line of the garden center at Meijer's or Lowe's or at a luncheon for my Tai Chi group...just about anywhere that the word "gardening" comes up.